This morning I saw a post from a friend that showed what states she had been in. I noticed that she had not been in Iowa, but had been in Nebraska. I also knew that she had flown into Omaha, which meant that most likely she had driven through Iowa to get to Omaha from the Omaha airport. Simply, there have been changes to the course of the Missouri River over time that have isolated parts of states on the opposite banks of the river. Tonight I will share a few of the notable ones. I will start with Carter Lake, Iowa which is the only city in Iowa west of the Missouri River. Carter Lake has a population of almost 4,000 and has an interesting history. You can see the state borders in the map above. 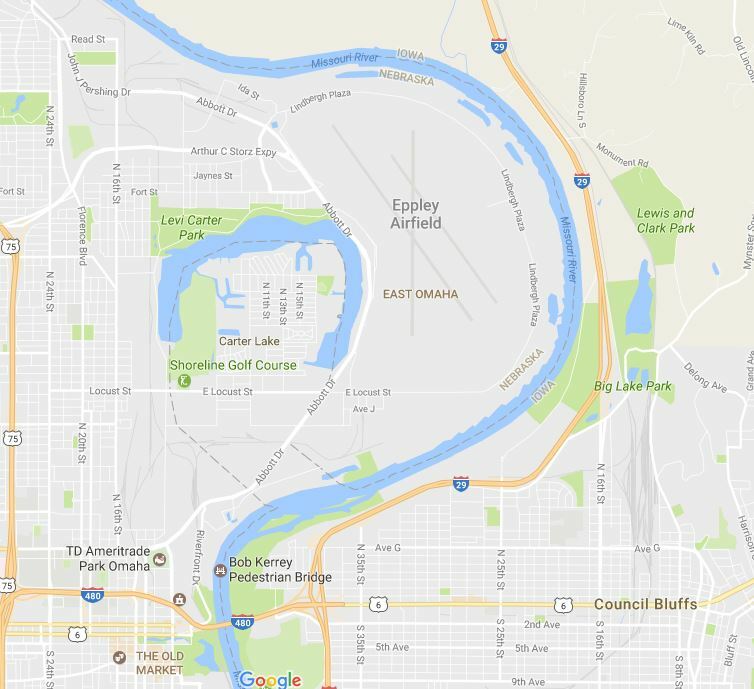 You can also imagine the original course of the Missouri River from the oxbow lake that was formed. In 1887 a flood broke through the oxbow bend in the river and isolated Carter Lake. On the map you can see that the road to the airport, Abbott Drive, runs through Carter Lake. You can get to downtown Omaha from the Omaha airport (Eppley Field) without driving through Iowa, but you have to take the north exit from the airport. The next anomaly also includes an airport. Here we see an other instance where an oxbow was breached by a flood. The river changed course during a flood in 1952. 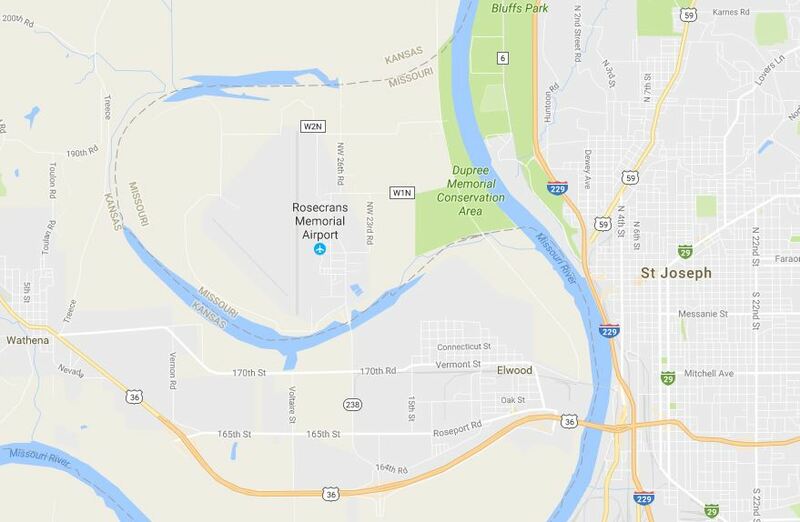 Before this the Rosecrans Memorial Airport was reachable from St Joseph Missouri by land. Now they have to drive through Kansas to reach the other side of the river. The area was originally known as the French Bottoms as many of the original settlers of the area were from France. Here is an instance where a part of Nebraska is on the Missouri side of the river. 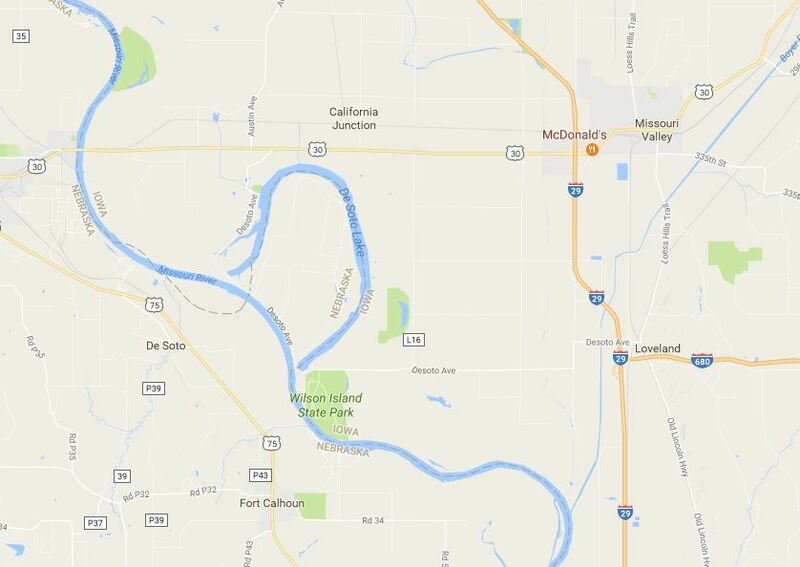 You can tell that the course of the river has changed since the state border between Missouri and Nebraska was set. In this case you do not see an oxbow lake, but you can see some remnants of the old course. 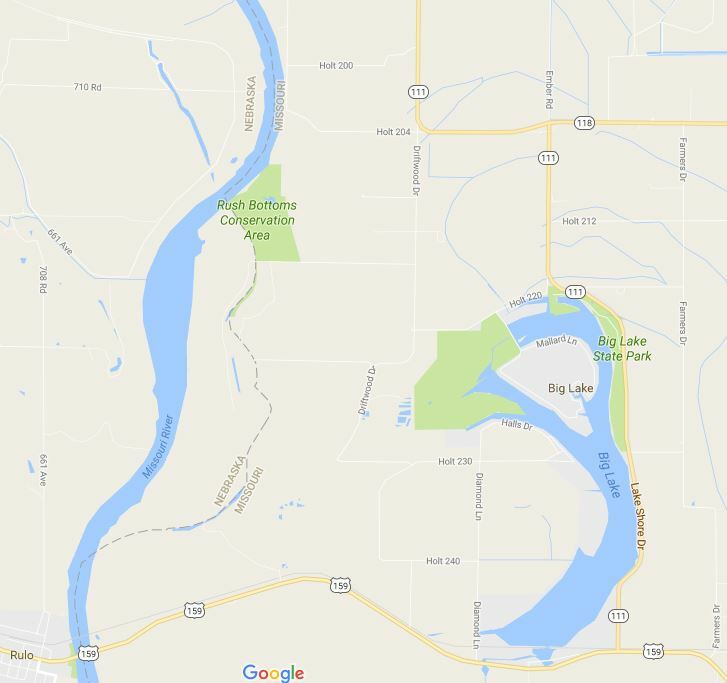 What is also interesting is that you can tell that Big Lake is an oxbow lake and at one time it was the course of the Missouri River. Big Lake was in existence in 1804 when visited by Lewis and Clark. In this map you see another area of Nebraska that is on the Missouri side of the Missouri River. The area is known as McKissick Island. The island was formed in 1867 when a flood dug out a channel and rerouted the river across the oxbow. The oxbow dried out and disappeared without forming an oxbow lake. Until 1930 the only way for the Nebraska residents to get to Nebraska was to either take a ferry or drive to Omaha or Kansas City to cross a bridge. Today the closest route to get to the other side of the river requires driving through Missouri and Iowa. However, the population of the area has dwindled and the last report I could find only mentions one house left on McKissick Island. 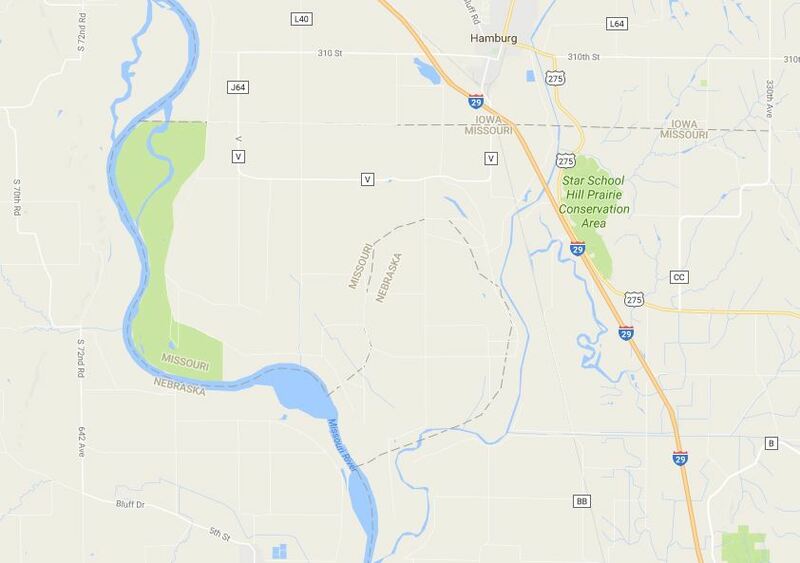 Part of my family history is from near this area in Hamburg, Iowa which is the closest town and where children from McKissick Island went to school. The children had to cross both the Missouri and Iowa state lines to get to their classes. Here is another interesting change in the Missouri River. You can see that the state borders do not exactly follow the river. Here we see DeSoto Lake which is another oxbow lake. However the creation of the lake was intentional and not caused by a flood. In 1958 a new channel for the Missouri River was created by the Army Corps of Engineers. They straightened the Missouri River channel which caused land from Iowa and Nebraska to end up on opposite sides of the river and also created the lake. Have you been to any of these anomalies? This entry was posted in History and tagged Border Anomaly, Carter Lake, Eppley Field, McKissick Island, Missouri, Missouri River, oxbow, oxbow lake, River Course Change, Rosecrans airport, St Joseph. Bookmark the permalink.